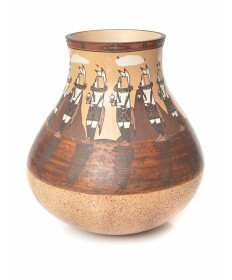 The Navajo have been making pottery (historically a task for women although both men and women create pottery today) for personal and ceremonial use for hundreds of years. Pottery within this culture as an art form developed in the late 19th Century as the railroads brought tourists into the region. 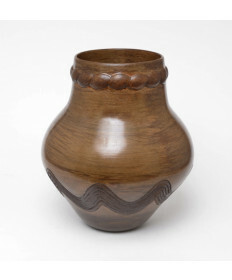 Navajo pottery is unique within native southwest cultures. Surface decoration is traditionally minimal. Clays are hand dug and several clay types may be mixed together to adjust the chemical, physical and aesthetic properties. They do not grind up old pottery shards to add to the clay for temper like other tribes. The Navajo consider old pottery to be the property of their Anasazi ancestors and should not be disturbed. The pots are created using the coil and pinch technique then pit fired with juniper wood for several hours. Before they have cooled, they are coated with hot pinon pitch which helps seal the surface of the clay and also gives the distinctive red-brown color found in Navajo pottery. Some potters consider the black smoke marks, called "fire clouds" to be a blessing from the creator and these are especially prized.